Start off your visit on the 12th (Wed): look for all kinds of wild species at Wildlife Areas. Get ready for a full day of sightseeing on the 13th (Thu): identify plant and animal life at Wildlife Areas, identify plant and animal life at Malcolm Douglas Crocodile Park and Animal Refuge, and then see the interesting displays at SSJG Heritage Centre. Discover how to plan a Broome trip in just a few steps with Inspirock's itinerary builder. New Delhi, India to Broome is an approximately 16.5-hour flight. The time zone difference when traveling from New Delhi to Broome is 2 hours. Traveling from New Delhi in June, you will find days in Broome are little chillier (35°C), and nights are colder (19°C). Finish your sightseeing early on the 13th (Thu) so you can travel to Darwin. Start off your visit on the 14th (Fri): get a dose of the wild on a nature and wildlife tour. On the 15th (Sat), you'll have a packed day of sightseeing: examine the collection at Defence of Darwin Experience, then brush up on your military savvy at Darwin Aviation Museum, and then cool off at Wave Lagoon. For other places to visit, ratings, traveler tips, and more tourist information, you can read our Darwin day trip planning tool . Traveling by flight from Broome to Darwin takes 6 hours. Alternatively, you can drive; or take a bus. You'll lose 1 hour traveling from Broome to Darwin due to the time zone difference. Expect somewhat warmer evenings in Darwin when traveling from Broome in June, with lows around 24°C. Finish your sightseeing early on the 15th (Sat) to allow enough time to travel to Alice Springs. 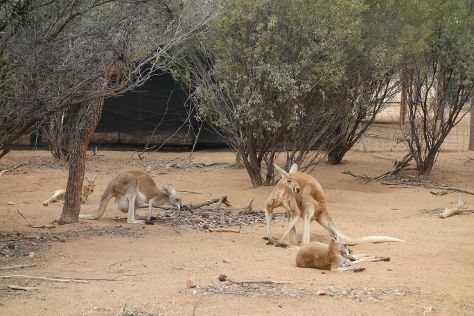 On the 16th (Sun), take in the dramatic natural features at The Emily and Jessie Gaps Nature Park, take some stellar pictures from Anzac Hill, then identify plant and animal life at Alice Springs Reptile Centre, and finally identify plant and animal life at Alice Springs Desert Park. To see photos, traveler tips, maps, and more tourist information, refer to the Alice Springs trip itinerary planning website . You can fly from Darwin to Alice Springs in 5.5 hours. Alternatively, you can drive; or take a bus. Expect much colder temperatures when traveling from Darwin in June; daily highs in Alice Springs reach 23°C and lows reach 5°C. Finish your sightseeing early on the 16th (Sun) so you can travel to Port Douglas. Kick off your visit on the 17th (Mon): see some colorful creatures with a scuba or snorkeling tour. To find traveler tips, photos, and more tourist information, use the Port Douglas online driving holiday planner . Traveling by combination of flight and shuttle from Alice Springs to Port Douglas takes 5.5 hours. Alternatively, you can drive; or take a bus. Traveling from Alice Springs in June, expect nights in Port Douglas to be warmer, around 21°C, while days are a bit warmer, around 30°C. Finish up your sightseeing early on the 17th (Mon) so you can go by car to Cairns. On the 18th (Tue), discover the deep blue sea with a scuba or snorkeling tour. Get ready for a full day of sightseeing on the next day: identify plant and animal life at Australian Butterfly Sanctuary, then tour the pleasant surroundings at Trinity Beach, and then kick back and relax at Palm Cove Beach. For reviews, traveler tips, where to stay, and tourist information, you can read our Cairns trip planning website . Drive from Port Douglas to Cairns in 1.5 hours. Alternatively, you can take a bus; or take a shuttle. In June, daytime highs in Cairns are 30°C, while nighttime lows are 22°C. Wrap up your sightseeing by early afternoon on the 20th (Thu) to allow time for travel back home.